Reliable performance of beams and slabs in shear is essential for the safety and also for the serviceability of reinforced concrete structures. A possible failure in shear is usually a brittle failure, which underlines the importance of the correct specification of the load carrying capacity in shear. The knowledge of performance in shear is steadily developing and it is now obvious that older structures were not always designed in accordance with contemporary requirements. The increasing load – mainly on bridges – requires the assessment of existing structures, often followed by their strengthening. An appropriate understanding of actual performance of concrete structures in shear is therefore of primary interest. 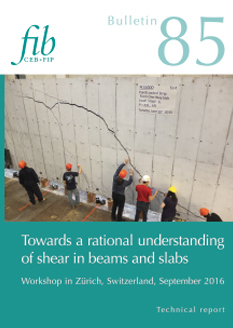 The workshop which was held in Zürich in 2016 brought together a significant number of outstanding specialists working in the field of shear design, who had a chance to exchange their opinions and proposals for improving the current knowledge of shear behaviour in beams and slabs. The specialists came from different parts of the world, which made the workshop general and representative. The workshop was organised by fib Working Party 2.2.1 “Shear in Beams” (convened by O. Bayrak), which is a part of fib Commission 2 "Analysis and Design". Individual contributions mainly address shear in beams with low transversal reinforcement. It is crucial because many existing structures lack such reinforcement. Different theories, e.g. Critical Shear Crack Theory (CSCT), Modified Compression Field Theory (MCFT), Multi-Action Shear Model (MASM), etc. were presented and compared with procedures used in selected national codes or in the fib Model Code 2010. The models for shear design were often based to a great extent on empirical experience. The refined presented models tend to take into account the physical mechanisms in structures more effectively. A brittle behaviour in shear requires not only to check the equilibrium and failure load, but also to follow the progress of failure, including the crack development and propagation, stress redistribution, etc. The significance of the size effect – which causes the nominal strength of a large structure to be smaller than that of a small structure – was pointed out. Nowadays, the fibre reinforcement is used more than before since it allows significant labour costs savings in the construction industry. The contribution of fibres is suitable for shear transfer. It is very convenient that not only ordinary fibre reinforced elements were addressed but also the UHPFRC beams. The production of this new material is indeed growing, while the development of design recommendations has not been sufficiently fast. Fatigue resistance of structures with low shear reinforcement is also an important issue, which was also addressed in this bulletin. It cannot be neglected in prestressed bridges, which are exposed to dynamic loads. The papers presented in the bulletin are a basis for the discussion in view of the development of updated design rules for the new fib Model Code (MC2020), which is currently under preparation. fib Bulletins like this one, dealing with shear, help to transfer knowledge from research to design practice. The authors are convinced that it will lead to better new structures design of as well as to savings and to a safety increase in older existing structures, whose future is often decided now. Download the copyright page (= list of authors) as a PDF file. Download the table of contents as a PDF file.